While other cups contain fruit in syrup or with artificial sweeteners, DOLE Fruit contains nothing but the fruit – real fruit in real fruit juice. DOLE Fruit in 100% juice offers a full serving of fruit in each 4-oz. cup, with the same nutrients as a serving of fresh fruit! These refreshing treats have 70 calories, no fat and 45 percent of the recommended daily allowance of Vitamin C.
Each package contains four individually sealed 4 oz. cups with easy-to-open, peel-off lids. Enjoy DOLE Fruit in 100% juice at home, in the office or on-the-go. They are perfect for a quick snack! 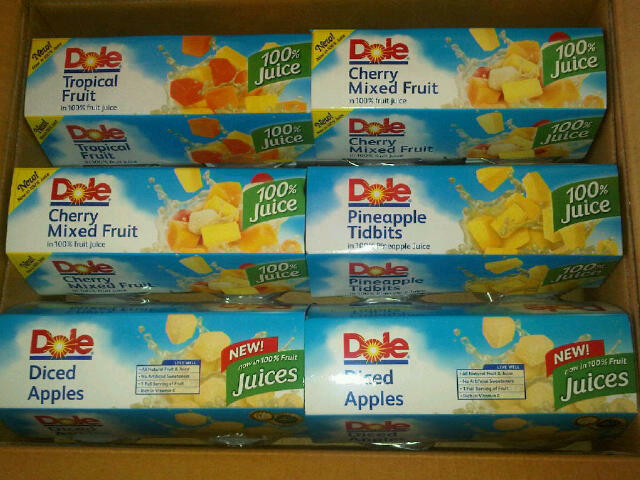 Look for all eight delicious varieties of DOLE Fruit Bowls all natural fruit in 100% juice in the canned fruit aisle. Have your Fruit in Fruit! 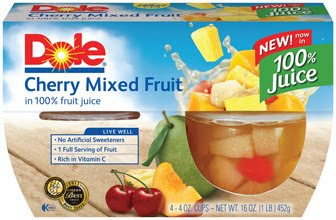 * DOLE Fruit Bowls in 100% Juice were awarded the 2011 ChefsBest® Award for Best Taste. The ChefsBest®Award for Best Taste is awarded to the brand rated highest overall among leading brands by independent professional chefs. Independentmami review-I like snacking made easy. The Dole Fruit bowls are perfect for everyday snacking. They are easy to take on the go. I checked the packaging and they range from 60-90 calories per container. The Dole Fruit bowls are perfect for every one of our family members. They contain no high fructose corn syrup or artificial sweeteners. And with 8 different varieties, Pineapple tidbits, Tropical Fruit, Mixed Fruit, Diced Peaches, Diced Pears, Cherry Mixed Fruit, Diced Apples, and Mandarin Oranges. My son loves the fruit. His favorite flavor is the Mandarin Oranges. My favorite is the Diced Apples. My husband loves the Diced Peaches. Would you like to win a box full of Dole Fruit bowls with the 6 different flavors? This giveaway ends on 02/21/11 at 8 am. 2 winners will win 1 box like the picture above. Please leave your email in the comment. I reserve the right to disqualify any for not following the rules. The winners will have 24 hrs to claim their prize. Good luck. ***Disclosure-I received product to review. No monetary compensation was received. This product has been Independentmami tested, and Independentmami approved. the Tropical Fruit because it's different and exotic. I would like to try the tropical fruit, because I really like those kind of fruits. I would like to try the Tropical fruits.. I know my husband would love it! I'm following you via Networked blogs! I would try the Cherry Mixed Fruit because I can't get enough of Cherries! I would like the tropical fruit because it looks like a good snack for work. Thanks! I'd like to try the tropical fruit. The Tropical Fruit sounds yummy! I would like to try the diced apples - they look really good! Cherry mixed fruit! email in my profile. I would like to try the pineapple tibbits. I would like to try the diced apples because I love apples! i would love to try the Diced Apples sound so good and different . I'd love to try Cherry Mixed Fruit! Sounds yummy, and I like Cherries! I would try the pineapple tidbits because they are not as sweet as the rest. i like tropical fruit, because is fresh combination. I'd like the Diced Apples, because that's one of my favorite fruits! I would like to win the Tropical Fruit because I love pineapples!